I’m so sorry about the really late blog, I’ve had a crazy week. I won’t even get into it!!! But trying to make this video is part of it. I really do apologize for the poor quality, I had so many issues, for once I was like let me show my face, and the steps and in the end it was the biggest pain in the who know where! So next time there won’t be much of that. I was relying on my husband, but he was working so hard and such long hours this week that when he was home, he was fast asleep. I had to record my recored video! How ghetto is that?? LOL, in that I lost a major step and that was the part where I show you how to cut the hoodie part of the hijab. I’m just going to write out a short step by step and I really hope you understand and I have provided a little diagram for you also. 1. 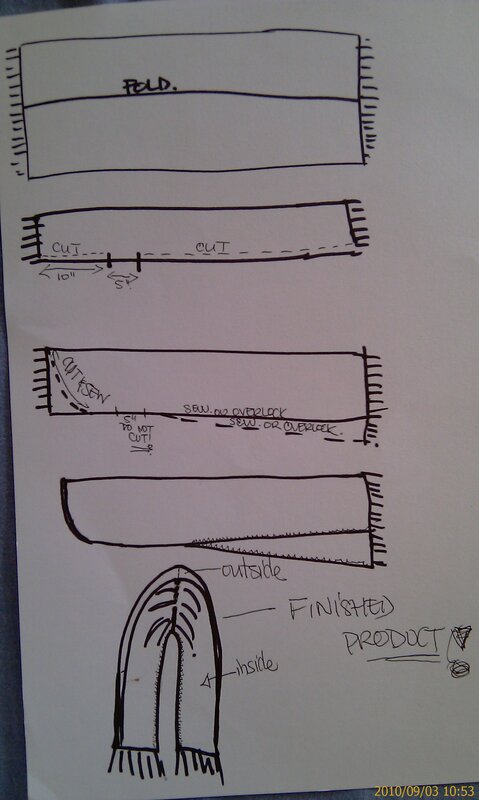 Fold your pashmina in half as shown in diagram. 2. Pin along the open edge to stop the fabric from moving. 3. Measure down 10″ on folded side and mark with pins, then measure down 5″ from that point and pin. 4. Cut open the 10″ fold to the 5″ mark and pin together the two sides to secure it. 5. Cut from the bottom of the pashmina up to the 5″ point (the really long slit). Remember to leave the 5″ area in tack, do not cut, you need this folded area!!! 6. Take your hoodie and place it over the pashmina as shown in the diagram. The hoodie is there as a guide, just follow your instincts and cut a nice curve. Pin along the curve to secure in place. 7. Sew the hoodie part of hijab, 1/2″, and as you get closer to the 5″ area, get closer to the edge. 8. If you do not have a serger or overlock machine, then hem the inner slit that you cut open earlier, a good guide to follow is 1/4 of an inch. Also serge/overlock or hem the hoodie seam, and the part the sticks out at the top, stitch it down with a straight stitch. If you don’t know what I mean, you will once you try on you hooded hijab. I hope to see pictures of your hooded hijabs!!! I’ll be making more from different materials and posting pictures in the future. Enjoy my crafty hijabi girlies!! !